Miracle in a Box: A Piano Reborn follows the restoration of a 1927 Steinway grand piano bequeathed to the music department at UC Berkeley with the stipulation that it be given to "a worthy student of piano." To find the most worthy student, the music department held the first Berkeley Piano Competition. 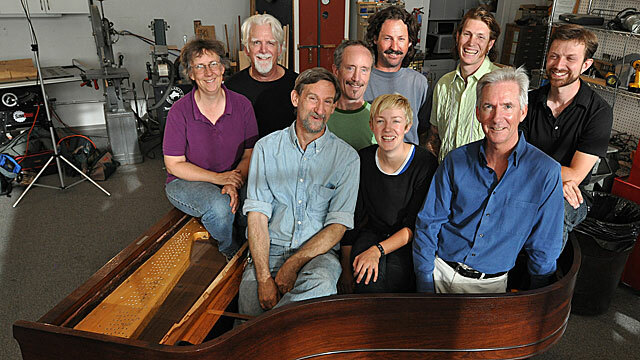 Performances from the piano competition provide the soundtrack for the film while highlighting the piano restoration work done at the Alameda, California workshop of Callahan Piano Service. The artisans take apart and rebuild the instrument, hewing to standards as precise as a tenth of a gram. The close relationships and easy humor of the workshop accompany the highly professional techniques and tools. Appearing in the film are Garrick Ohlsson (touring concert pianist), Jake Heggie (opera composer), Tammy Hall (jazz artist), Frederick Hodges (music stylist), Jerry Kuderna (pianist), and Steve Willis (blues and boogie songwriter and performer). Narrated by John Lithgow.